Barré-Sinoussi was born in Paris, France in 1947. Her interest in science started while she was young, spending her school vacation time in the parks of Paris observing plants and animals, curious about their behaviour. In school, she found that she did better in the sciences than the humanities. She had wanted to become a doctor but her parents weren’t wealthy and she thought an education in the sciences might be more affordable and take less time. After two years studying at the University of Paris, she decided to test if she was on the right path and started as a volunteer at the prestigious Pasteur Institute, becoming a part-time worker and then moving on to full-time. She attended the university only to take the exams, borrowing the notes of her fellow students. She got her PhD in 1975. After a stint at the US National Institutes of Health, she returned to the Pasteur Institute where her research focused on a subset of viruses called retroviruses and their link to leukemia in mice. What’s a retrovirus? Firstly, a virus is an infectious agent which replicates inside the living cells of other organisms. A retrovirus also uses cells to replicate but does so by creating and inserting a strand of viral DNA into the cell’s own DNA (cellular DNA). The cell then uses its cellular DNA to produce more retroviruses which go on to infect other cells. By 1982, a group of French scientists suspected that AIDS might be caused by a retrovirus. They approached Luc Montagnier, Barré-Sinoussi, and others at the Pasteur Institute, due to their experience with retroviruses. In December they gave Montagnier and Barré-Sinoussi a sample of lymph nodes from a patient showing early signs of AIDS. One key to determining if a retrovirus was involved was to check for reverse transcriptase activity, something Barré-Sinoussi had experience in doing. 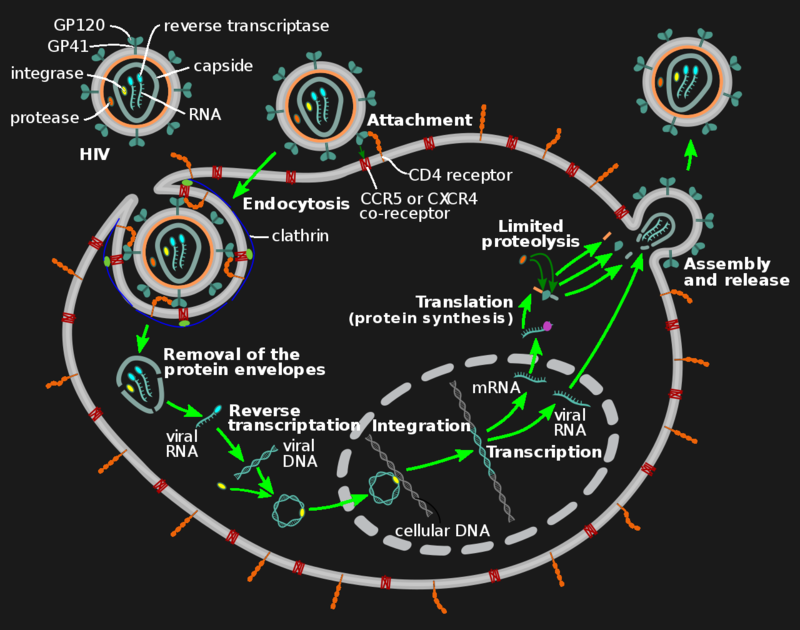 Reverse transcriptase is an enzyme which generates viral DNA from viral RNA (see diagram). She placed cells from the lymph nodes into a culture dish. Every three days for two weeks, she checked if the infected cells were producing new retroviruses. This involved centrifuging the culture medium to separate out the produced viruses. 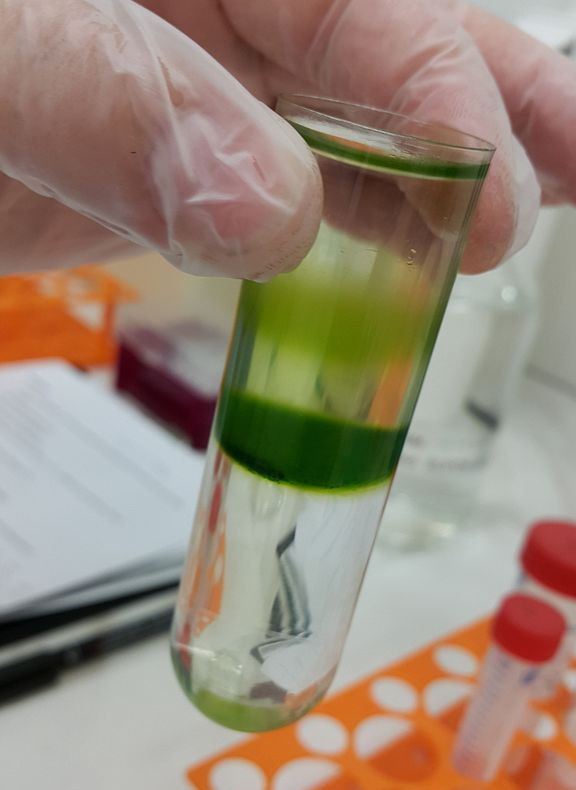 That was then centrifuged in a sugar gradient. In the second week, the density which showed the highest enzyme activity correlated with what was known for retroviruses. For further confirmation, she looked for any metal ions. Metal ions would be used by the enzyme while generating the DNA from RNA. She found magnesium ions, further confirming that she’d found a retrovirus. Montagnier, Barré-Sinoussi, and their colleagues were also able to show that the type of white blood cells being infected were T-helper cells. White blood cells are the immune system cells involved in protecting the body against infectious disease. This explained why infected patients had so few white blood cells. Using an electron microscope they were able to obtain the image shown here of the retroviruses budding from infected T cells. The retrovirus was at this time called LAV (Lymphadenopathy Associated Virus) but later when more was known it was given the name we now know, HIV (Human Immunodeficiency Virus). In May 1983, Barré-Sinoussi and the rest of the team at the Institute published an article about their discovery in the journal Science. But the discovery of HIV was not without controversy. In the US, a group led by Robert Gallo published similar results in the same issue of Science. Barré-Sinoussi’s team is now credited with discovering HIV and Gallo’s group is credited with discovering that HIV is the cause of AIDS. In 1988, Barré-Sinoussi was given her own lab at the Pasteur Institute and in 1992 was made the head of the Institute’s Biology of Retroviruses Unit. She continued to do research surrounding HIV including the role of the immune system in controlling HIV, transmission from mother to child, and study of the characteristics of HIV-positive individuals whose bodies are able to limit HIV replication without the use of antiretroviral drugs. She’s co-authored more than 240 scientific publications and participated in many of the Pasteur Institute’s committees and scientific societies as well as other AIDS organizations. She’s also been a consultant for the WHO (World Health Organization) and the UNAIDS-HIV among others. And that’s just a shortened list of her research and public activities. In 2009 she wrote an open letter to Pope Benedict XVI (translation), who on his way to Africa made statements that condoms are at best ineffective in the AIDS crisis. She became President of the International AIDS Society in 2012. Among many other awards, in 2008 she received the Nobel Prize in Physiology or Medicine along with HIV co-discoverer Luc Montagnier. She officially retired in 2015 and her lab was closed down. However, she’s still very active. For example, in 2018 she became the President of Sidaction, a charity for creating awareness in AIDS and for raising charitable funds. She shows no signs of slowing down. Thanks! And I had a look at the Ebola story, wow. Quite a bit went on there. Françoise Barré-Sinoussi went on to a great career. Ah religious faith. Throughout history it’s been such a force of good in the world. In what became the beginnings of organized gay activism, there was tremendous push-back against AIDS being caused by a transmittable disease. The idea that you could catch it in a San Francisco gay bath house (not by bathing) was just unacceptable. Their arguments and vehement opposition became lore for a lot of people who did not pay much attention, and it was repeated as fact quite often by people who didn’t know any better. To the bathhouse patrons this knowledge was a threat to their lifestyle. Thus it was hard to accept which did cost lives. After a fight the majority eventually did and life progresses. To the religious the existence of protection is a threat to their control over other peoples’ lifestyles. (supposedly not even their own wink wink) After decades of study they still do not accept this knowledge and are still costing a whole lot more lives. In attempting to gain support, the AIDS activists embarked on a major campaign to declare it as a heterosexual disease (in the US) and shouted down researchers who failed to find cases of female to male transmission – without which you can’t have a hetero epidemic. But the condom makers welcomed the idea and supported the hetero epidemic idea enthusiastically, as well as government agencies, and the rest is history. If it wasn’t such a hot-button issue, it would be a great case to study the dissemination of information and the acceptance of facts versus propaganda. Pasteur was able to “isolate” the rabies virus, but it could not be “seen” until many years later. In Amsterdam right now for next week’s International AIDS Conference. I’ll be filming interviews there, and expect I’ll see her at some point.